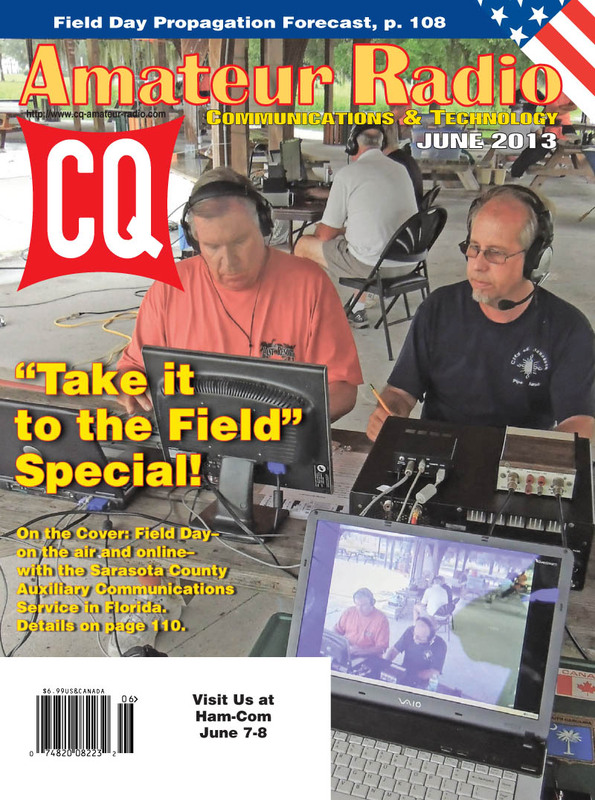 The June issue of CQ is our third annual Take it to the Field Special, with eight articles and columns on operating away from your home station. Our front cover combines traditional radio at ARRL's annual Field Day with live internet streaming by members of the Sarasota County Auxiliary Communications Service in Florida ... an operation that was cut short by rain and wind from Tropical Storm Debbie. Our lead feature is by well-known ham radio hiker Dennis Blanchard, K1YPP (author of Three Hundred Zeros, a book about operating QRP while hiking the Appalachian Trail), on his half-century of combining ham radio with long distance hiking, both in the U.S. and in Europe. 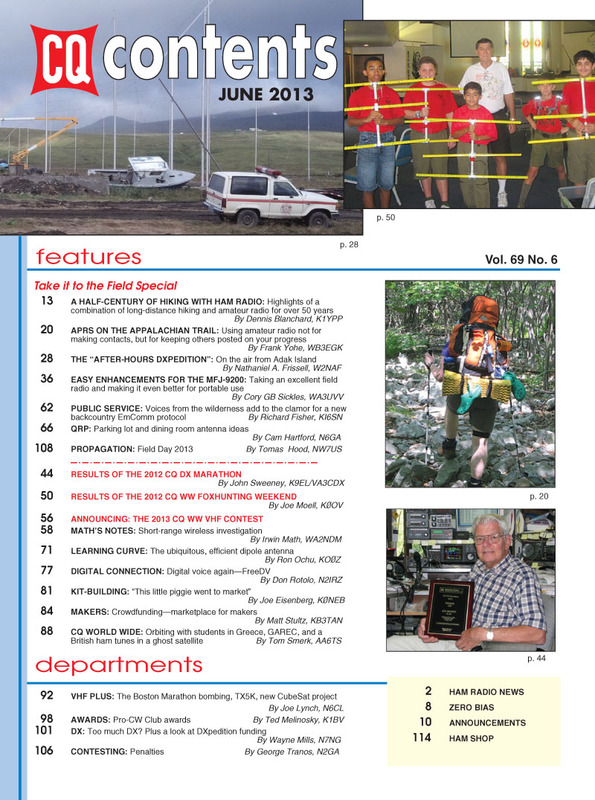 Next, Frank Yohe, WB3EGK, shares his experiences with using APRS along the Appalachian Trail; Nathaniel Frissell, W2NAF, recounts his operations from the far western Aleutian Islands while helping to set up a new radar facility for aurora research, and Cory Sickles, WA3UVV, offers up some "Easy Enhancements for the MFJ-9200," a popular rig for portable operating. 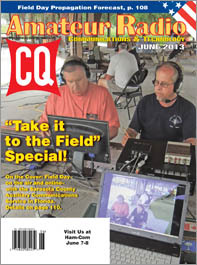 We've also got results of the 2012 CQ World Wide Foxhunting Weekend, which also gets hams out into the field; our Public Service column continues a discussion started in April about updating the Wilderness Protocol; QRP Editor Cam Hartford, N6GA, discusses "Parking Lot and Dining Room Antenna Ideas" and Propagation Editor Tomas Hood, NW7US, offers up his predictions for band conditions on Field Day weekend. If portable operating isn't your "thing," we've got plenty of other great articles as well, including results of the 2012 CQ DX Marathon, rules for the 2013 CQ WW VHF Contest (July 20-21), "Math's Notes" on Short-Range Wireless Investigation, and a look at "The Ubiquitous, Efficient Dipole Antenna" in this month's Learning Curve. Kit-Building Editor Joe Eisenberg, K0NEB, looks at the PigRig, a kit from the Flying Pigs QRP Club; Makers Editor Matt Stultz, KB3TAN, explains "crowdfunding" and its potential in the ham radio marketplace; "CQ World Wide" takes us "Orbiting with Students in Greece" and takes a look at an upcoming international emergency communications conference and the story of a British ham who tuned in a "ghost satellite." VHF Editor Joe Lynch, N6CL, discusses the Boston Marathon bombing, the TX5K DXpedition, new cubesats and more; DX Editor Wayne Mills, N7NG, looks at DXpedition funding and wonders (only briefly) if he might be suffering from DX overload; Awards Editor Ted Melinosky, K1BV, introduces awards from the PRO-CW Club in Romania, and Contesting Editor George Tranos, N2GA, discusses penalties in contest scoring (and how to avoid them). That's a brief look at what's coming up in the June issue of CQ magazine -- in print and online. For information on becoming a CQ subscriber - to either our print or digital edition - click here! Zero Bias - "Black & White Radio"